If you have driven past the corner of Hwy. 23 and Commerce you may have noticed the Ken Wallace construction crew working hard at the former Napa Auto parts, now owned by Shake Rag Alley. I talked with Mike Christensen, Manager of the Longbranch Gallery, and the new President of the Shake Rag Alley Board of Directors, to find out more about the status of this project. HSB: Tell us what is happening at the Quonset Hut. 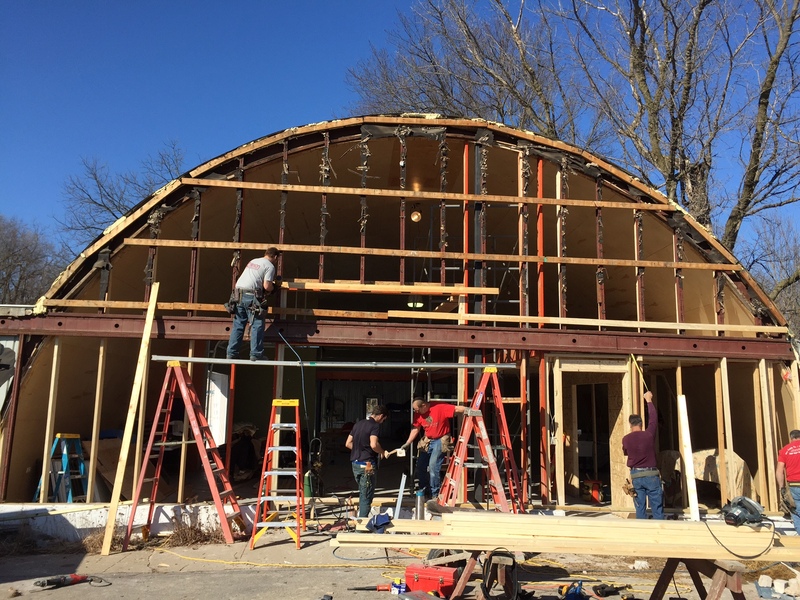 Over a year ago, we reported on Shake Rag’s acquisition of the Quonset Hut and the effort to raise funds to renovate (see this post from July 2013), but we noticed a lot of activity down there recently. Can you tell us what’s happening? MC: The truth is that most people don’t know that we’ve been renovating the building on the inside for over a year. 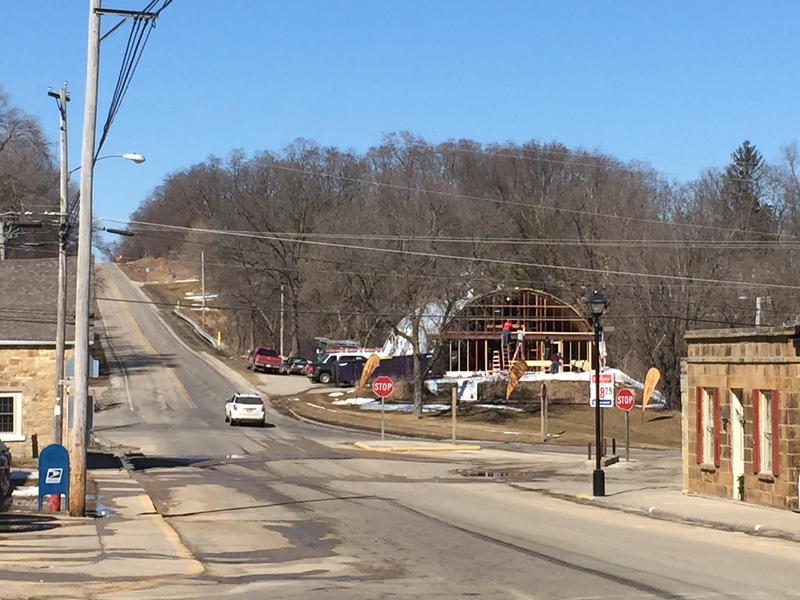 Ken Wallace of Mineral Point has been the lead contractor, and his vision and expertise has made this a very pleasant experience for all of us at Shake Rag. When he and his crew took down the south wall this week, everyone noticed! Soon, a new wall will be constructed, and it will have several large windows that will go up almost to the top of the arch of the building. 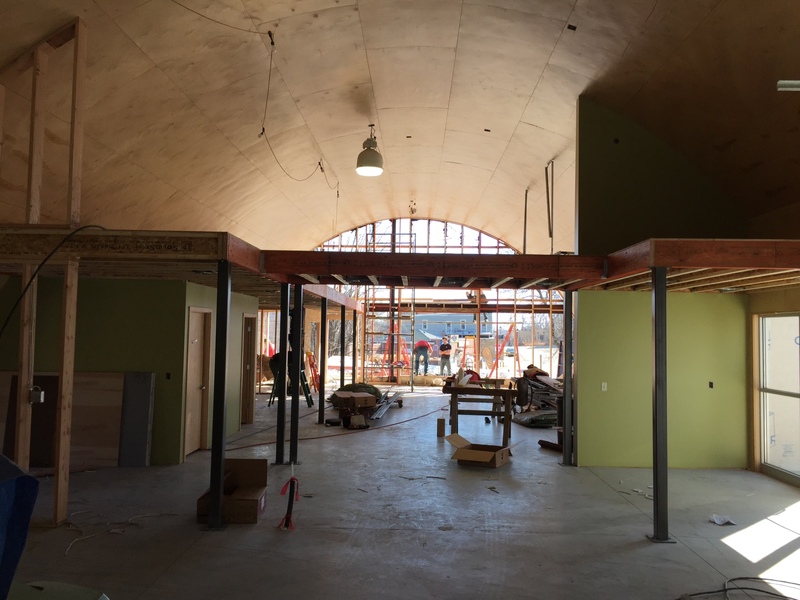 On the inside, a mezzanine is being built for added storage, and sinks and countertops for workshops will be added. An HVAC system and interior lights will be added in the coming weeks. The final completion date is set for later this spring. 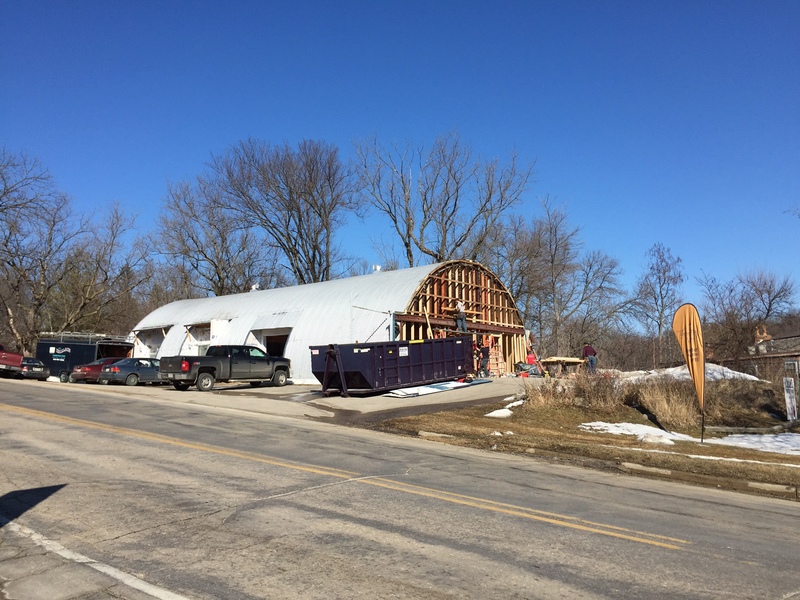 HSB: We understand that the Quonset Hut will now be called the Lind Pavilion, can you tell us about John Lind? MC: Our dear friend and fellow board member, John Lind, passed away early last summer. (Click here to read more about John.) I’ve never met someone as passionate and hardworking as John, and his presence has been greatly missed. When he died, his family approached Shake Rag with an idea that would leave John’s legacy with us forever. They knew how much John loved Shake Rag and what this new building would mean to the future of the organization. The Lind family generously offered to fund the remaining project at the quonset hut. We are naming it the “Lind Pavilion” in honor of John and his family. Everyone at Shake Rag owes the Lind family a huge and heartfelt thank you. HSB: What are Shake Rag’s plans for the Lind Pavilion? MC: The Lind Pavilion will provide a spacious setting for our many workshops throughout the year. It will essentially be one large open room with the opportunity to section off the building for multiple workshops at once. With a capacity of 150 people, this space is also ideal for community and private events, such as wedding receptions, family reunions, graduation parties, or birthdays. We’re exploring the possibility of making it available for corporate retreats as well. Our own workshops and events are almost always on weekends, which means the Lind Pavilion and the rest of our beautiful campus is open for rentals whenever it is not in use. Megan O’Connell, our Executive Director, is happy to share more information. She can be reached at Shake Rag’s main office at 987-3292. In addition to answering our questions, Mike took a few pictures of the work in progress. Check them out. We look forward to watching the Lind Pavilion continue to take shape and will report back on its progress. This entry was posted in Architecture, Art and tagged John Lind, Ken Wallace, Lind Pavilion, Mike Christensen, Shake Rag Alley. Bookmark the permalink.